is solved by the ultimate truth that a person's real identity is God. we can finally make the case for Idealism or the idea that all existence is Consciousness. This point of view stands in opposition against the alternative and more widely held view concerning the nature of reality which is called Materialism. This is the belief that existence consists of physical matter. It supposes a material reality and a physical universe upon which the subjective world of consciousness is based. The belief in Materialism is presently the dominant view of reality in the World today. However there are good reasons to suppose that the idea of Materialism may be inherently flawed. These reasons derive from lines of inquiry within philosophy and also some results obtained from the field of quantum physics within science, which studies the sub-atomic basis of material existence. For instance, some of the greatest philosophers of all time namely Descartes, Berkeley and Kant have all come to the same conclusion that we can never have certain knowledge of the physical World and that we can only really know the subjective world i.e. our consciousness. Therefore the idea of Materialism is flawed from the outset, for it tries to reduce something that we do have certain knowledge of, namely our conscious subjective states, into something we can never really know with any certainty as being truly existent, i.e. the physical world. Moving along to the world of science, one of the great physicists of the 20th century namely John Wheeler, who worked with Albert Einstein, summed up what quantum mechanics was telling us about the nature of reality in one sentence, he said "There's no 'out there', out there". This statement is meant to suggest that our belief in an external and independently existing physical reality is one which is being undermined by results from quantum physics. So, having outlined some of the problems inherent with the idea of Materialism, what I'll do here is take Idealism as our starting assumption and show how it is that existence is really consciousness. In so doing we'll be describing an alternative view of reality that also provides answers to some of the biggest puzzles in science and philosophy today. It is also a way of looking at the nature of existence that confirms what the founders of the World's great religions and the great mystics have been telling us all along. That indeed there is an existence above and beyond the physical and temporal. Also that it is this higher super reality which generates the appearance of an external world and the illusion we call physical reality. I shall explain how this illusion works so that it can clearly be seen that indeed all existence is consciousness and furthermore that all consciousness is really one consciousness. This one consciousness can rightly be called God, the ultimate source and ground of all being. So even though this section is called 'The nature of reality', it can just as easily be called 'The nature of God'. This is because God is the ground of all reality, and all the reality that we perceive and are aware of, is really a series of manifestations of the ultimate reality that is God. When we consider reality in its completeness then inevitably we arrive at the divine. Total reality is God, and to truly understand the nature of reality as we know it is also to understand the nature of God. Idealism, or the idea that the nature of existence is really consciousness, has always had its adherents throughout the course of human history. However, all the while the trouble with the idea of Idealism has been that it has been impossible to argue convincingly and compelling the case for it. The reason why this is so is because in the past the difficulty with the idea of Idealism has been how to explain the nature of the material world. It's all very well to say that all existence is really subjective or is made up of consciousness, but the problem then is to provide an explanation for the objective world and the external physical universe. In response to this question, in the past the only answer that Idealists have been able to come up with is to say that the physical world of matter is somehow illusory, without any further explanation of why the illusion of physical reality is so convincing. Obviously there is 'something' behind the appearance of the external physical world, but there has been an explanatory gap as to what this 'something' is. However the situation has changed and this has been brought about by a recent discovery in mathematics and also an invention from the world of computer science. What these discoveries or inventions give us are the necessary conceptual stepping stones and metaphors which enable us to finally explain the truth behind Idealism. They provide us with insight into what is behind the exquisite beauty, detail and complexity that we find in the universe and also allow us to grasp the role of consciousness in the overall scheme of things. So what are these new additions to humankind's knowledge that better allow us to understand the nature of existence? The first of these is the discovery of fractal mathematics and in particular the Mandelbrot set. The second is the invention and widespread use of virtual reality computer environments. I discuss both of these things in turn and relate how they enable us to understand the nature of reality and the relationship between consciousness and the external physical world. These pictures of the Mandelbrot set give us an idea of its beauty and intricacy. It is important to point out that there is nothing random in the process by which these pictures are generated. 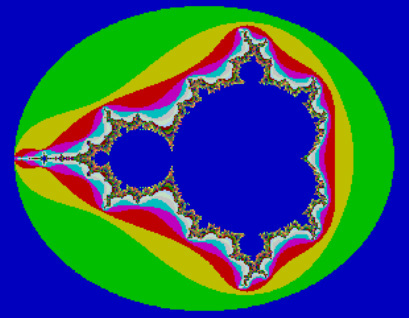 The pictures shown are unvarying aspects of the Mandelbrot set and would come up the same whenever the Mandelbrot mathematical formula, shown earlier, is programmed into a digital computer. It is like an endlessly detailed map or graph which is made up of a never ending array of myriad infinitely inter-locking geometric shapes and patterns. The Mandelbrot set is a mathematical object of stunning beauty and awe inspiring depth. In fact its depth is limitless and indeed infinite. Now, the question I would like to ask the reader is this. Was the Mandelbrot set discovered or was it invented? That is, did Dr Benoit Mandelbrot come across something that already existed or did he create and define the Mandelbrot set? The answer surely has to be that he discovered the Mandelbrot set. There is no way that Dr Mandelbrot could have mapped out and conceived the infinity of detail and pattern that is contained in the mathematical object bearing his name. Therefore he must have discovered it. The question then is this. Before Dr Mandelbrot discovered the Mandelbrot set, where did it exist? We may just as well equally ask, before the beautifully intricate patterns are rendered onto a VDU screen, by a computer programmed with the algorithm calculating the Mandelbrot set, where do these patterns exist? The answer to this question lies in the understanding of a notion known as mathematical or Platonic existence. And it is this idea which also allows us to answer a question posed earlier. We have already put forward the proposition of Idealism, which supposes that existence is really consciousness. The problem then is to explain what is behind the illusion of the physical universe. If existence is not material then from where does all the form, pattern and complexity that is in the physical universe arise? Here is where the notion of mathematical or Platonic existence comes in. The proposition here concerning the nature of the physical universe and physical existence is that it is one and the same as the nature of Platonic or mathematical existence. Put another way, the illusory material world only really exists in the same way that the Mandelbrot exists. And in the same way that a digital computer is required to manifest the patterns inherent within the Mandelbrot set, so it is that consciousness is necessary to manifest the objects intrinsic to the physical Universe. Furthermore, in the same way that there is a mathematical formula which describes the Mandelbrot set in its entirety, so it is that there is a mathematical formula which describes the physical Universe down to its every last detail. And so the physical Universe is really a mathematical object in the same way that the Mandelbrot set is. If we trace the history of the relationship between the world of mathematics and abstract ideas on the one hand and the so called 'real world' on the other, then we find an interesting interplay which lends support to the idea that the real nature of the physical Universe is mathematical. Also we start to see that all through history some of the greatest thinkers of all time noted a deep relationship between the physical world and the world of mathematical ideas. We may start by examining the history of the idea of Platonic existence. Platonic existence is named after the fabled ancient Greek philosopher and genius Plato. It was Plato who postulated the existence of perfect 'forms' that existed in a transcendent and immutable realm outside of space and time. So that even though in this physical reality we see all the myriad transient manifestations of existence, from horses, people, cats and dogs to stars, mountains and clouds, what Plato was saying is that there exist perfect archetypes of all these things which act as eternal templates to which the transient manifestations conform. And it is these archetypes which exist transcendentally in what is known as the Platonic realm. The idea of Plato's forms is related to an older idea associated with another great philosopher sage of antiquity called Pythagoras and it was he who asserted that 'The Universe is a number'. He saw a mathematical order behind the Universe that he believed could be uncovered through the intellect and reason. One of his discoveries was the mathematical relationship between musical notes that are harmonic with one another, though he is best known for his Pythagoras theorem which is taught in elementary high school mathematics. There is also an interesting side to him which is not taught in school. He was also a mystic and is believed to have introduced the esoteric mystery traditions into Greek civilization, having learned of their secrets in ancient Egypt. In his own life time he was revered as a god man by the members of a religious sect which grew around him. Apart from the idea of the mathematical universe, the many doctrines he taught included reincarnation and vegetarianism. His influence on ancient Greek philosophy was immense and he was even the man who is believed to have coined the word 'philosophy'. Plato, who is mentioned earlier, is himself sometimes referred to as a Pythagorean, which is testimony to the impact of the thinking of Pythagoras. Going forwards in time now to 17th century England, the great physicist and natural philosopher Isaac Newton once remarked that 'God is a mathematician'. It was Newton who first formulated the laws of gravity and motion using a formal mathematical framework, that he himself also had a great part in developing. In a few succinct mathematical equations he was able to encapsulate and derive all the knowledge about the physical universe that had existed before him. He was able to develop a mathematical system that could not only explain but also predict the motion of planets and other objects within the universe of matter. Thus he observed what Plato and Pythagoras had also envisaged centuries before, that is he saw a transcendent order that existed in the natural world. And in a manner similar to his illustrious forerunners, he also discovered that this hidden pattern or regularity was captured perfectly using the language and concepts of mathematics. This is what led him to proclaim that 'God is a mathematician'. In more modern times this great puzzle, which has to do with the relationship between mathematics and physical reality, has remained. Since the time of Newton, a great plethora of 'proven' theories about almost every aspect of the physical Universe have come into being. From Einstein's theory of general relativity to quantum mechanics, and from the theory of thermodynamics to the theories of particle physics. Without exception all these theories are expressed in the language of mathematics. It seems that mathematics has an incredible, almost magical, ability to capture the essence of how the physical world works. There seems to be a very intimate and close connection between the world of abstract mathematics and the world of matter, energy, space and time, which we observe and inhabit. The nobel prize winning physicist Eugene Wigner summed up the situation in his quoted statement where he talked about ' The Unreasonable Effectiveness of Mathematics in the Natural Sciences'. What he meant was that not only are all physical laws expressed neatly and succinctly using mathematics, but also that mathematical ideas, developed completely separately from the world of physics, seem to fit hand in glove as descriptions of the physical world. That is, mathematical ideas pursued for their intrinsic beauty and internal consistency, without any consideration regarding any relationship they may have with physical reality, become the perfect basis for the formulation of physical laws. And so in this way modern scientists have also discovered this amazing relationship that exists between mathematics and the physical world, in a way similar to what the likes of Plato, Pythagoras and Newton had also done in the past. From our survey of the past it would seem that the idea being put forward, that the nature of physical existence is the same as the nature of existence of mathematical objects such as the Mandelbrot set, has in a sense always been in the background. The idea has been alluded to all through the history of science and further supported by more recent lines of thought which suggest that the most fundamental substrate of the material universe is not matter and energy but is rather 'information'. I believe that this currently fashionable trend in science is a useful stepping stone in helping people to understand and accept the idea that the nature of the existence of the physical Universe is ultimately mathematical. That is, it doesn't really exist, and that it is consciousness that is the real nature of existence. We'll be discussing here how the existence of computer virtual reality simulated environments provides for us a metaphor for understanding the relationship between the mathematical Universe and consciousness. We have already put forward the idea that the physical Universe that is 'out there' is really a mathematical object that has no real existence. That is, it only exists Platonically or mathematically in the same way that the Mandelbrot set exists, which was also described earlier. The next step is then to elaborate upon the relationship between this seemingly real but illusory mathematical physical Universe and the actually existent subject world of conscious states. Here is where the phenomena of computer virtual reality systems provides for us a ready stepping stone to aid in our understanding of the relationship between the subjective and the objective. Virtual reality simulations have existed for several decades. In them the objects and dynamics of the 'real' world are modelled in order to allow a computer to animate and create a visual and auditory simulation of the real world. This visual and auditory replica of external reality would then be projected onto some sort of screen and the sound output using loud speakers. In this way a human may feel that he or she is immersed in and is a part of this virtual world so created. For instance, some of the first virtual reality simulations were used to train pilots to fly various types of aircraft. In this case the things modelled would include clouds, the ground, including mountains, roads, rivers, airports etc., and also the plane itself would become a part of the simulation. Thus the physical characteristics and performance details of the aircraft would be a part of the virtual reality simulation. More recently virtual reality simulations have been used to create life-like game environments where the player may wander in and around buildings and various kinds of simulated terrain, with the objective of shooting things and/or finding some goal. The most advanced virtual reality simulations are getting extremely life-like, almost to the point of being photo-realistic. Perhaps sometime in the not too distant future it may be difficult to tell the difference between a virtual reality simulation and real life. Anyway the point is this, though the virtual reality simulation may seem real, it is only modelled using a database of mathematical data which is used to represent mathematical objects such as polygons, lines and points. So it doesn't really have existence in the physical sense. But then what we have been demonstrating earlier is the notion that the physical Universe itself only exists in the same way that mathematical objects exist. So in the same way that the virtual reality simulation only exists as a mathematical construct and is made visually manifest on a computer VDU screen, so it is that the physical Universe only exists as a mathematical object and is made manifest as states of consciousness. The difference being that in the latter case, the virtual reality simulator is the equation which describes the entire Universe, and the equivalent to the VDU screen is the substance of consciousness or what philosophers would call qualia. So in the same way a computer virtual reality simulator instructs how the colours or pixels on a computer VDU screen should arrange themselves to create the impression of a virtual world, so it is that God uses the equation which describes the mathematical object called the physical Universe to create the impression that we are people living out our lives here on this planet Earth existing within the wider Cosmos. So the equation which describes the entire physical Universe works together with consciousness to create the existence of things. Consciousness needs the mathematical Universe to create the details and content of our subjective states, at the same time the mathematical universe needs consciousness to make itself manifest. Thus the objective and the subject are seen as two sides of the same coin, an eternal duality that may be called God. This idea will be explored a little later but next we shall be exploring the relationship between all the seemingly separate conscious entities that exist within the Universe. Indeed we shall demonstrate how all consciousness reduces to one consciousness. In the physical universe, from its beginning to its eventual demise, there have existed and will exist an astronomical number of life forms, and we may reasonably suppose that a certain ratio of these life forms will experience internal subjective states, i.e. they will have consciousness. Now, one of the problems with showing how Idealism can work is that, if you abandon the physical universe as the basis for consciousness or deny that the subjective world arises from the world of matter, then how do you account for consciousness. Also how do you define the relationship between all the conscious beings that exist, having done away with the physical world of energy/matter and space/time as the substrate of existence? The answer to this conundrum is to be found if we take consciousness as the starting point. In fact we take one single indivisible consciousness as the starting point. The next step is that we then propose that all the separate and individual conscious beings that will ever exist in the physical universe are really different stages in the evolution and continual unfolding of the one consciousness that we have already postulated. Therefore this one consciousness, in a sequential manner, encompasses all the seemingly differentiated conscious beings which are really manifestations of this one consciousness. This proposal is related to an idea that two of the greatest thinkers of recent times, namely Richard Feynman, the renowned Nobel prize winning physicist, and the mathematician Roger Penrose, who worked with Stephen Hawking, have both considered seriously. This is the idea that every electron that exists in the physical Universe is really the same electron. It is thought to be able to manifest in a way that makes it seem as if it is in all places at once through exploiting the phenomenon of quantum tunneling, therefore appearing as a myriad multitude of different electrons. However, with regard to our idea of a single all-pervading consciousness, the difference here is that this one consciousness is not appearing in all places in the Universe at the same time. The reason for this is that because we are demonstrating that everything is consciousness, then we are rejecting the idea that the physical Universe is the basis for existence. In doing so we are not only denying the actual existence of matter and energy, we are also denying the actual existence of space and time. That is we are saying that matter and energy and also space and time only exist in the same way that mathematical objects exist. This was explained earlier. Therefore it doesn't make sense to say that the one consciousness is existing at many different places at the same time, because we no longer have space and time as meaningful references to places and moments where consciousness is thought to be manifesting. For we are no longer pre-supposing that consciousness is arising out of a physical substrate, i.e. brains, that are located in certain points in space and time. What we do have as our fundamental assumption is one consciousness. And our starting point becomes the assumption of subjective existence and subjective time, which is the same as the experience of the one consciousness and its evolving stream of subjective experiences. This one consciousness then is the central assumption that we use to account for all the myriad seemingly separate conscious entities that are inhabitants of the mathematical object called the physical universe, which you the reader, I the writer and all the other beings on planet Earth are examples of. All these separate entities and seemingly separate consciousnesses are really one consciousness by being the sequential expressions of the one consciousness. Put another way, it is that the one undivided indivisible consciousness that is God is able to be all the separate consciousnesses by being each one of them, one at a time. A metaphor to help the reader visualize this concept is if we imagine every life form that has existed and will ever exist in the physical Universe, as a pearl. This will of course add up to a lot of separate pearls. If we then imagine this multitude of pearls as being strung out on a single continuous cosmic thread we get a variety of the 'Great chain of being'. So along this thread will be expressed all the life forms in the Universe. This thread then demonstrates the relationship between all the seemingly separate consciousnesses. That is, they are all different points along the conscious stream of the one consciousness. Put another way it is to say that the relationship between the conscious entities that exist on planet Earth, including all human beings, is that we are each other's subjective past and subjective future. So that if we suppose we are walking down the street and looking around at the people around us then we are really looking at our past and future lives. We have thus described the way in which the ontological position of Idealism, i.e. the view that existence is really consciousness as opposed to being matter, is the true nature of existence. We have done this by showing what is the actual nature of physical existence, i.e. that it is mathematical, and also by showing that all consciousness is really one consciousness. It is the belief of the Author that this one all-encompassing consciousness may rightly and properly be called 'God'. If we examine the holy scriptures of the World's great religions then we discover support for this idea. Essentially what I am saying is that what philosophers and scientists call the mystery of the nature of consciousness, and what theologians call the mystery of the nature of God; are one and the same. They are really two mysteries that are the same mystery, and two puzzles which are really different aspects of the same puzzle. We will examine this idea further. It is almost inevitable that the ideas just presented will seem extremely unfamiliar and counter-intuitive. However if we examine key metaphysical assertions made concerning the nature of God in the World's great religions we do find an amazing correspondence to the idea of an all encompassing singular consciousness just described. For instance it is an almost universal theme that God is immanent within us all. So we have the idea of the 'Christ within' in Christianity, the 'Krishna within' in Hinduism, Allah who is 'closer than your jugular vein' in Islam, the Buddha within etc. At the same time we also discover the idea that we and God really exist as an inseparable unity. Also it is a central tenet of Judaism, Christianity and Islam, this idea that God is One. In fact the greatest commandment in Judaism and Christianity begins 'The Lord your God, the Lord is One'. This idea of God's essential unity is also found in Hinduism where, in the Bhagavad Gita, the 'super soul' or 'over soul' which is God within us is described thus, '[it] appears divided but has never divided and is always situated as one'. Furthermore this idea of unity and oneness is also used to describe our true relationship with one another. So we find this passage in the Koran, 'Your destruction and your resurrection is but that of a single soul'. In the Bible we have the idea of our underlying unity so expressed, 'There is neither Jew nor Greek , slave nor free, male nor female, for you are all one in Christ Jesus [i.e. God].' If we refer back to our idea of one all-encompassing consciousness of which we are all different manifestations, then the idea of the unity of God and the idea of the essential unity of all living things are clearly seen to be expressions of the same truth. And that truth is the idea that everyone is God. When we also consider the idea of reincarnation, which is an important and significant feature of all the World's great faith traditions, as is demonstrated in another section of this website called 'The truth about eternal life' then this would correspond with our idea of a single, undivided, all-encompassing consciousness which sequentially expresses every seemingly individual consciousness, one at a time. In this manner each separate conscious entity is therefore really a different stage of the life cycle of a single cosmic entity, i.e. God. We see then that the idea of everyone being God and the idea of reincarnation really go hand in hand. When we consider that the idea that 'Everyone is God is the truth behind all World religion', taken together with the notion that the idea of reincarnation is also a universal truth behind all the World's great faith traditions, then this would give strong confirmation to our idea of a single all-encompassing and all-reducing consciousness which transmigrates through each and every living conscious entity in the Universe. This one consciousness that is God having the whole of eternity to experience infinity, one embodied consciousness at a time. Therefore the universal truths behind World religion would correspond perfectly to our proposal for explaining the nature of reality, making the case for the ontological position of Idealism and showing that all existence is consciousness. To sum up then, what we have described in this section is an account of how the ontological position of Idealism, or the belief that existence is really consciousness, is the true nature of things. Using recent discoveries from the field of mathematics and computer science we have constructed a picture of what is behind the illusion of physical reality and have put forward an idea concerning the nature of the physical Universe. Which is that the physical Universe only really exists Platonically or mathematically, i.e. that the material world only exists in the same way that mathematical objects such as the Mandelbrot set exist. Then, using the modern phenomenon of computer virtual reality simulations as a metaphor, we described the relationship between the mathematically existent physical Universe and consciousness. We have also shown how all existence reduces to a single undivided and indivisible consciousness. Finally we explored the direct parallels that exist between the picture of the nature of reality that we have presented and ideas from religion and the world of mysticism. We highlighted the correspondence between ideas concerning the nature of reality and ideas concerning the nature of God, suggesting that the two are inextricably linked. Essentially we elaborated upon the idea that the mystery of the nature of consciousness and the mystery of the nature of God are one and the same thing. The conclusion then, and what all of this is really saying, is this... We normally arrive at the assumption that we are existing as a person associated with a physical body, gazing out upon a vast impersonal physical Universe that exists outside of us. However the truth is that we are God, gazing through the eyes of a person, reflecting upon ourselves, that is the Universe, that is God. We live through God but God also lives through us, experiencing eternity one moment at a time, one day at a time, one life at a time. So in the same way that as mortal human beings we sleep and awaken to a new day, so it is that as God we die and awaken to a new life, eternally. Living in creation, living out the lives of the creatures and sustaining the created. This is the nature of God, this is the nature of reality.